Ni no Kuni II : Revenant Kingdom is a game that tries to be better than its predecessor, using every trick and gimmick to its disposal but ultimately failing to recapture the Ghibli infused magic of the original. The return to the world of Ni no Kuni was highly anticipated, as trailers showed off a revamped combat system, a tower defence style of gameplay and a charming city-building mechanic promising the player a bigger, better experience. Combined with the iconic art style Level-5 has canonically adopted from Studio Ghibli, Revenant Kingdom tries appealing to fans of the original, anime junkies and JRPG fans but ultimately falls short of the bar set by the previous outing. 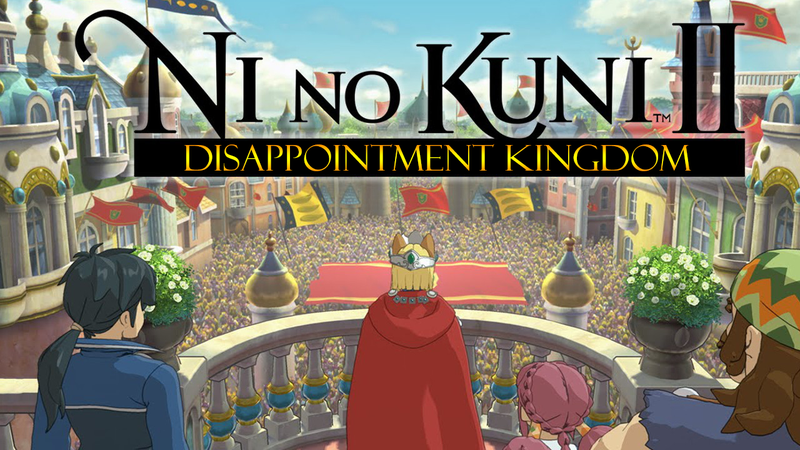 Set years after the original Ni no Kuni: II follows King Evan Pettiwhisker Tildrum, a half-human half-cat ruler whose kingdom is taken over by a coup de tat. With the help of U.S President, who has been teleported from his own world they fight against the coup and found the kingdom of Evermore with the ambition of creating a world with no war. While it’s not a retread of the original, adding a large range of new characters to the roster, a new map and locations, the story is overly simplistic and follows tired tropes. It’s a shame it suffers from sequel-itis because it does a lot of things very well. The combat has been drastically improved, as the original’s semi-turn based ‘Familiars’ system could sometimes be infuriatingly hard to master. Replacing it is real time melee combat with options for powered up moves and usage of ranged weapons like magic wands, longbows and guns. Instead of the large range of catchable Familiars there is a new range of creatures called the ‘Higgedies’ which aid you in combat. While they do have the charming look of Ghibli spirits, their designs lack the variety of the familiars as well as holding an inconsequential role in the combat system. The combat is exciting but the melee system is so straightforward that it makes fighting enemies and bosses much too easy. In some circumstances you might spend a little longer than usual fighting an optional boss, but there is little challenge to it after figuring out the basics. The tower defence segments can be fun and are the most original addition to the gameplay, but get repetitive and offer little room for creativity in how you take down rivals. Played on the world map, you take down enemies and fortresses with a ring of fighters controlling their formation with the shoulder buttons. It breaks up the monotony of the hundreds of side quests you have to do in order to improve your kingdom in the city builder segments. It’s nice to have a base to expand on and call your own, but the city builder is nothing more than a free-to-play mobile phone game without the micro-transactions. You build a little bit of your city to grant exp rewards and unlock utilities, new skills but there’s not much to it. It doesn’t grant you the freedom to place things where you want to, unlock things when you want to and at certain points in the game you will force you to spend time on this to proceed with the main story. Mostly this involves zig-zagging across the world completing fetch quests to lure people into staying in your kingdom. These segments bring back memories of the debut WiiWare title Final Fantasy Crystal Chronicles: My Life as a King, a city builder featuring a small blond exiled king who looks suspiciously similar to the short displaced king of this game. A city builder set in the FFCC universe, it starts you off with high expectations, coming as a spin-off of a fantastic game. But after a few hours you realise it is slow, unrewarding and took out the main element of what you found so fun about the series to begin with. The art direction of the original Wrath of the White Witch for DS and PS3 was a meticulously crafted miracle. Big anime studios and mangaka have had a true kinship with the gaming community ever since Akira Toriyama’s character designs blew Dragon Quest into the biggest franchise in Japan. Ghibli was most famous studio of them all by 2008, but had barely touched on the medium since Nausicaä, a crappy mid -80s shoot em-up for the NEC PC-6001. Hayao Miyazaki reportedly condemned the game and cut ties with the industry, as the violent tone of the game conflicted with the message of peace he wanted to convey with Nausicaä. When Level-5 announced they were making a game with Ghibli, gamers rejoiced around the world as they would finally be able to play through one of their marvellous worlds. Revenant Kingdom did not have input from Studio Ghibli which is a warning sign for anyone interested because of their legacy, but it does have some staff from the first game like animator Yoshiyuki Momose and composer Joe Hisashi. There is no beautiful hand drawn cutscenes, but the game does a great job at looking magical without them. Listening to the score by Hisashi is like visiting an old friend’s house after they’ve moved. It’s familiar and pleasant to see it at first, but then you realise that the lights are off and nobody’s home. The soundtrack has some new and engaging songs, but the main theme running through the game is a constant reminder that this is an inferior sequel. There is a distinct emptiness and shallowness to some parts of the world map. There are large areas that you are excited to explore at the start of the game, but once you are able to reach them you find that there’s nothing there apart from a dull side quest. Some of the game is beautifully animated and devised, but others like the caves and dungeons feel lazy and poorly designed. The progression of games with large world maps restricts you from exploring later game locations and continents to maintain an aura of mystery. Ni no Kuni II manages to do this up until you get the ability to traverse water, after which you realise there is nothing much worth exploring outside of the first continent. Ni No Kuni II is a flawed game, but not a bad one. The main elements of story and the world have problems when compared to the original, the gameplay becomes repetitive and the characters are less likeable, but ultimately it is worth playing if you are looking for a JRPG that doesn’t take hundreds of hours to complete. Clocking in at about 30 hours, it does enough in that timespan to hold the attention of anyone looking for a colourful game that reminds them of their favourite animated worlds, but if you’re looking for an unforgettable experience you’d probably be better off digging out a copy of the original.